A while ago, China-based Google's servers were massively attacked by the hackers. The intrusion caused a lot of tension that now it has reached the state level issue. Even more, Secretary of State Hillary Clinton's speech on this issue infuriated Chinese Officials temperament. Remarks like 'Information Imperialism' are coming out from Chinese side.
" In an interconnected world, an attack on one nation's networks can be an attack on all. " This is obvious to me that Chinese hackers attack on Google's servers is the attack on US. The message is conveyed. I just wish this doesn't go any further than that. It kind of looked like a movie called 'wargame', where one kid accesses a network thinking it's not inter-connected, and launches a cyber-war game just out of fun. Later, it turned out to be connected to security networks and the simulation of attacks taking place in virtual world, and then Nation's generals getting freaked out thinking it's real and almost getting ready to launch real life attacks to other suspected Nation without thinking a bit. That was a movie. The fire is lit someway similar, and now it's become in-between Nation's issues. 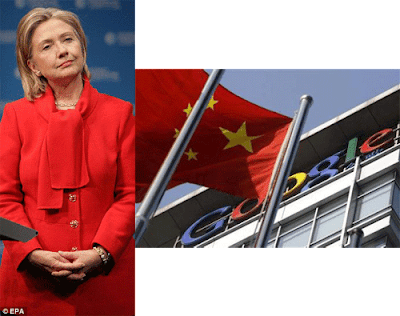 With some Chinese hackers attempt to access human right's gmail accounts, Google almost readied to back out and then big mama had to step in. China think it's disrespectful how the comment was made upon. It further said, they need no Internet lesson from US when US advocated for Net Neutrality. They claimed that they are themselves the victim of cyber-attacks and urged not to make harsh comments before proper consultation which could deteriorate two-nation's relationship. Whatever was done, that was so wrong. You have no right to break into other peoples house and try to steal things. That's what Chinese hackers did. They should resolve this issue ASAP by stopping such activities instead of cover-up. When asked, if Google would stop all it's products and services in China, the answer was negative. They wish to remain in China for their other products and services. Let's hope it doesn't go anything further than this and they settle down things on mutual understanding. Before things get heated up, we must understand that we're going no where if cyber battle continues. Baidu will become more dominant in China once Google backs out. But recent developing news is getting more interesting. Baidu is suing US based domain registrar over Iranian Hackers attack on Baidu.com. Now, someone needs to put big powerful glasses. Stop acting blind.